KURE BEACH, N.C. – This spring, the coastal town of Kure Beach will continue its efforts to keep its shoreline in prime condition through a beach cleanup and dune restoration project. A clean beach is an important factor to take into consideration when choosing a seaside vacation destination, and North Carolina’s small wonder is a prime example of one that goes above and beyond to provide visitors with a protected and preserved coast for years to come. 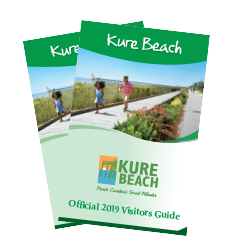 Find information on some of Kure Beach’s most natural wonders below, as well as specifics on how nature lovers and the North Carolina community will get the chance to help keep this source of beauty and relaxation in its best condition while exploring the island this season. It’s time to spring clean! Each year, volunteers come to the coast to help minimize pollution and protect the marine environment. In order to maintain the town’s scenic beachfront, the town of Kure Beach will host its annual Beach Sweep on Saturday, April 11. Volunteers are asked to meet at the Kure Beach Fishing Pier at 9:00 a.m. to pitch in, where they will be given gloves, trash bags and further instructions. Attendees are encouraged to wear comfortable clothing and shoes. Sand dunes act as buffers to protect upland property and natural habitats. Most importantly, they reduce erosion by providing a barrier to the movement of high tides and waves. Kure Beach&apos;s Shoreline Access, Beach Protection and Parking Committee is looking for volunteers to help plant sea oats to keep the sand dunes strong and resilient on Saturday, April 18 at 9:00 a.m. Sea oats help anchor the sand dunes, so they can continue to trap sand and build. Visitors can help be good stewards to the coastal environment by lending their hands in this important renourishment project. While in town, visitors may want to explore a separate area of the island that is less well-known and only visible during low tide. Located near the coast of Fort Fisher, Kure Beach’s coquina rock formation is host to a very rare and distinctive mossy hard rock outcropping. The rock is cemented together by seashells and coral with an estimated origin ranging from 12,000 to 80,000 years ago. It’s a true natural wonder and remains the only rock formation on the coast of North Carolina that is home to a variety of wildlife. Visitors to the Kure Beach area should explore the natural surroundings that Fort Fisher State Recreation Area has to offer. Located at the south end of Kure Beach, the park is known for its six-mile span of natural, undeveloped beach. Take a walk down a trail that meanders through marshes and maritime forests to view sound-side flora and fauna and spot one of 16 threatened and endangered species. Or, simply comb the beach for sea stars, urchins and whelk shells. Go on an excursion to one of the most unusual areas of North Carolina’s coast, Zeke’s Island, which is only accessible by boat. Located in the Cape Fear River basin, the reserve features dynamic landscapes like tidal flats, salt marshes, shrub thicket, maritime forest, sand dunes and ocean beaches that set it apart from other areas. Wildlife also has a huge presence there. The lagoon-like intertidal complex found at Zeke’s Island is known as one of the most important shorebird feeding habitats on the East Coast thanks to species including great blue herons, dunlin, white ibis and more. Also, the Atlantic Loggerhead sea turtles and green sea turtles, which are federally protected and threatened species, occasionally nest on the site’s open beaches.